Children. I haven't had or raised any, but as a teacher and then an elementary school principal, I called several hundred children "mine." 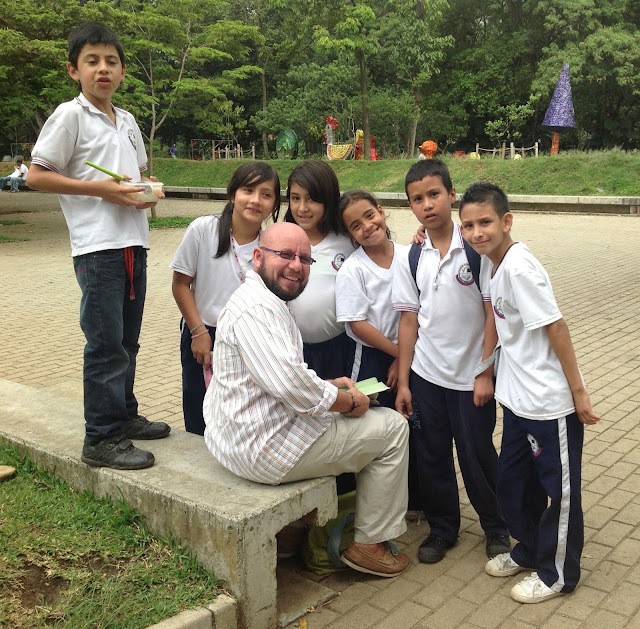 Today - here are some pictures of school kids in Colombia. When we visit tourist attractions, we sometimes run into school groups. The kids make me smile wistfully. They help me remember who I have been. Today, especially, these pictures tug at my heart. This first one was taken during our recent trip to Medellín. After walking around Medellín's Botanical Gardens, my mom and I disappeared into los baños to powder our noses while Ean waited outside. When we returned, we found Ean surrounded by kids. Like hummingbirds to a bright red flower, they had been drawn by THE IPAD. I took this picture of them, using the iPad, of course. Then they all wanted to know how their names would be pronounced in English. We couldn't figure out why they wanted to hear their beautiful names in flat-sounding American English. Como se dice Jessica? Well, that would be "Jessica." Angelina? Angeline. Juan Diego? Uh, JOHN. Sorry, dude. 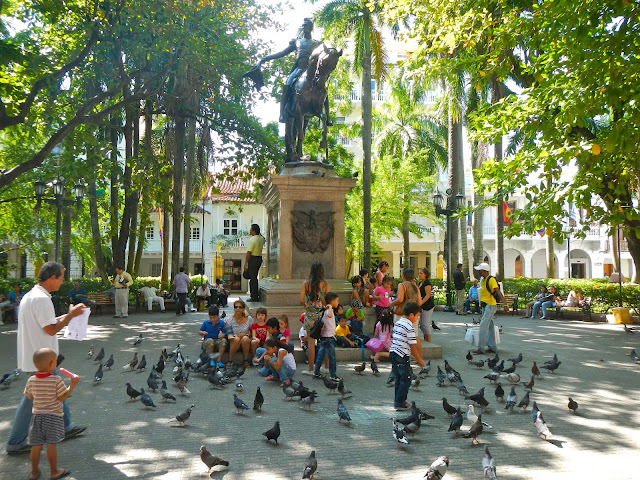 Here in Cartagena, a few days ago, we took a stroll from my mom's apartment to the Parque Simón Bolívar. 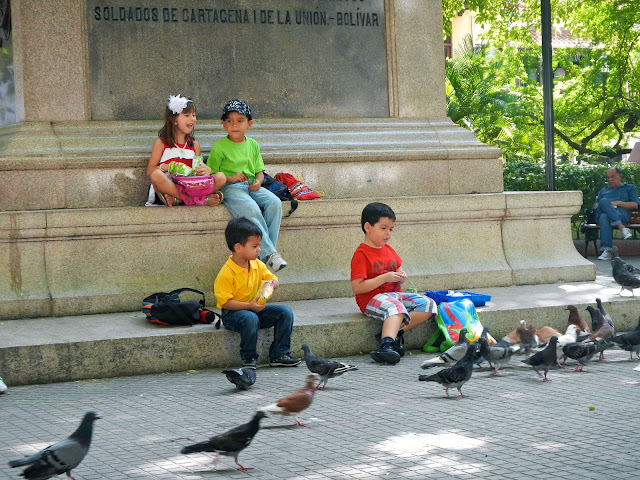 The kids, sharing their lunches with the pigeons, were more captivating than the statue, for sure. Although the statue was very nice too. I so adore this last picture. Children: doing their own thing. Living their lives with joy and concentration. We often turn kids into appendages or herd them in groups, and they are imagined to be adults-in-waiting. But this picture reminds me that children have their own important and individual lives, which sometimes don't have much to do with us grown ups. When I was an educator, I worked fiercely for my children's future, but perhaps I didn't appreciate them, enough, as individuals. I mourn, fiercely, today, for these 20 individuals, these children whose futures, along with their little bodies, were smashed by sprays of bullets.